Hey! I'm pimping out Poodleism on blog hops again today. I'm always looking for new blog friends and this is the only way I can think of. Any of you bloggers have any thoughts on the topic? English. I've dabbled in German and Spanish but it would just be a lie to say I spoke them. No. I probably should. My office neightbor has some One-A-Day Gummies that are pretty delish. I try to scam on those when I think of it. Cheese. Cheeses of all sorts will seduce me every time. From a Kraft single to a fancy goat cheese dollop, I'll find a way to cheese up any meal. Need evidence? See muffin tops. Cheese overtook me again. Since we're on the topic, this weekend I ate 2 lunches with a heavy goat cheese component. It's arguably my favorite food and two meals in a weekend is like a cheesy heaven for me. Manfriend is rolling his eyes somewhere. GOSSIP GIRL is in my near future. I look forward to it like I'm having a Skype session with my real best friends. It's sick, but I can't help myself. On my desk I have 5 different purple writing utensils. Why? Dumb. Seattle is soon. So, blissfully, awesomely, amazingly SOOON. NERDS are good. I ate a little mini Halloween box of NERDS and remember how freaking good they are. Does anyone remember the boxes that came with 2 spouts and there were different flavors that came out of them? I wonder if those still exisit. I probably shouldn't go down this rabbit hole. Manfriend is the best. We had a fabulous weekend together and I was just thinking that to myself when he texted that he left work early to play with the Prince. What a gem. I probably don't deserve him. Thanks for sticking with me today! 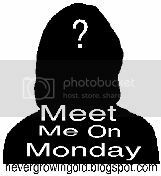 i'm stopping by from mingle monday and wanted to say hello! what a cute blog you have - and i too heart gossip girl! Hi, I am a new follower from Java's Hop, your blog is so cute! I too like cheese..any and all kinds but my down fall is sweets. Thanks for visiting my blog! I LOVE goat cheese too!! Looking forward to following you more!